It's that time again. 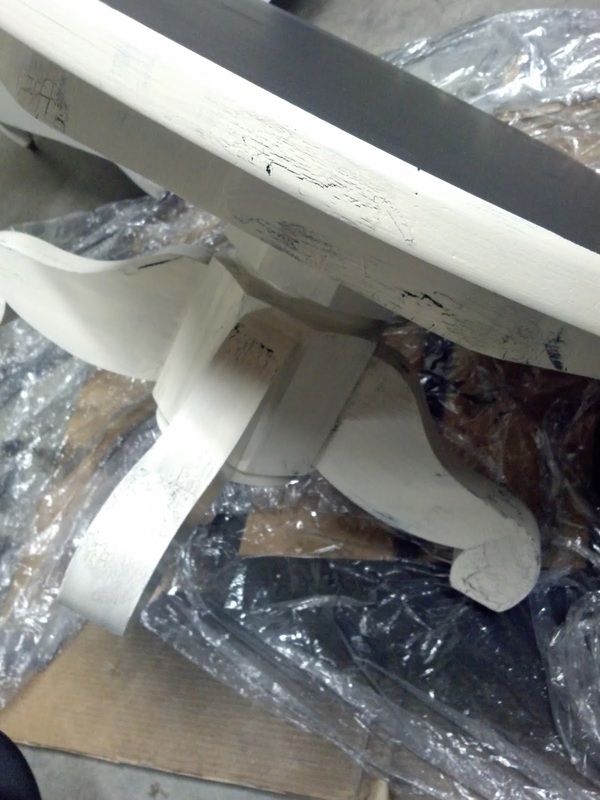 The day when my furniture painting friends and I complete a themed challenge to transform a piece of furniture with paint. This month's theme? POTTERY BARN INSPIRATIONS. And who doesn't love Pottery Barn? Like you, I can't wait to see what everyone has done for this challenge! 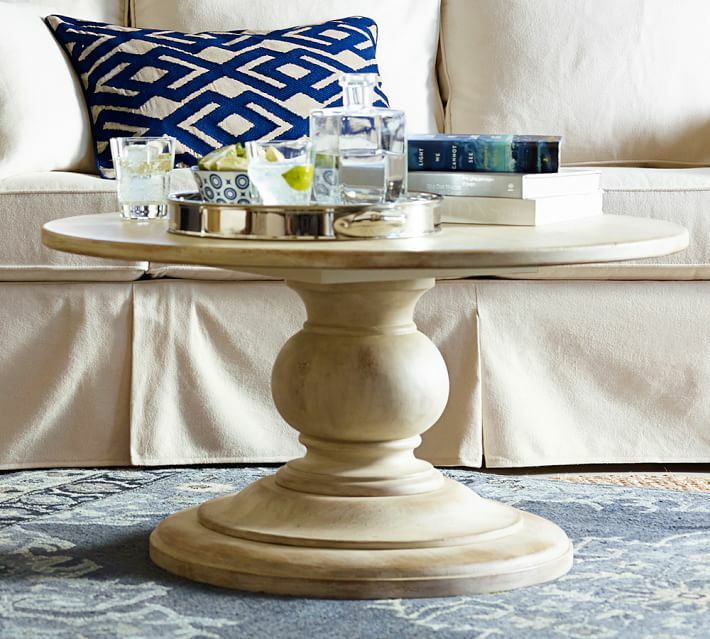 My piece was inspired by this beautiful pedestal coffee table, found at Pottery Barn. I realize it's not an exact replica. But I really like the way this one turned out. Now let me show you how it was when I found rescued it. It was unsold at the end of a local estate sale so I got it for $20. I guess most people couldn't see beyond the 1970's orange. I like the shape and size of it and knew it would look much better with a face lift. I had a vision for this piece. 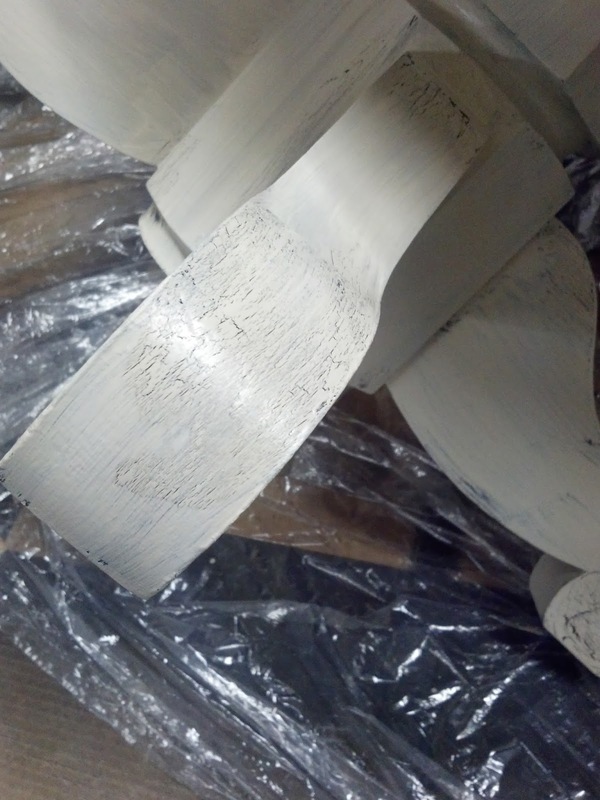 It involved multiple layers and various specialty paints. First I painted the whole table black. I brushed everything except the top in Benjamin Moore Onyx. 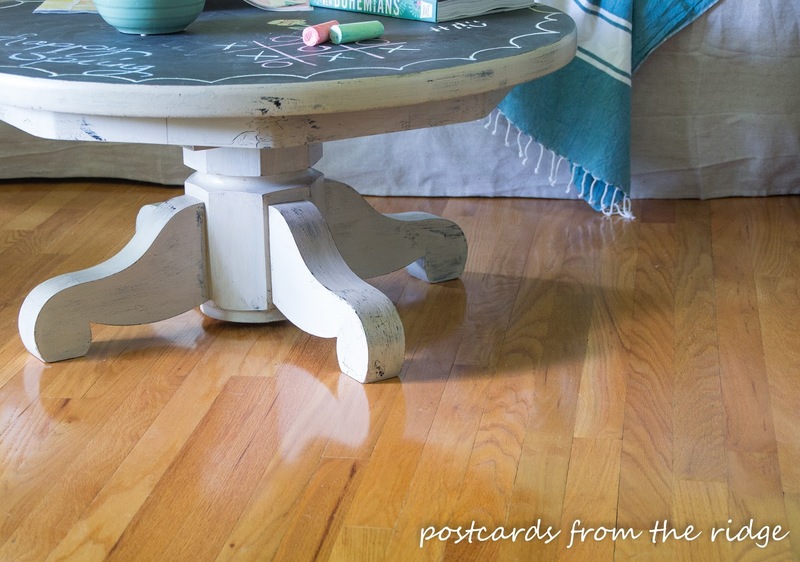 And on the top of the table, I sprayed it with two coats of my favorite chalkboard paint, found here. After that dried, I added touches of my favorite crackle medium in various places for a bit of character. Then I painted the legs and base an off white shade. Voila! 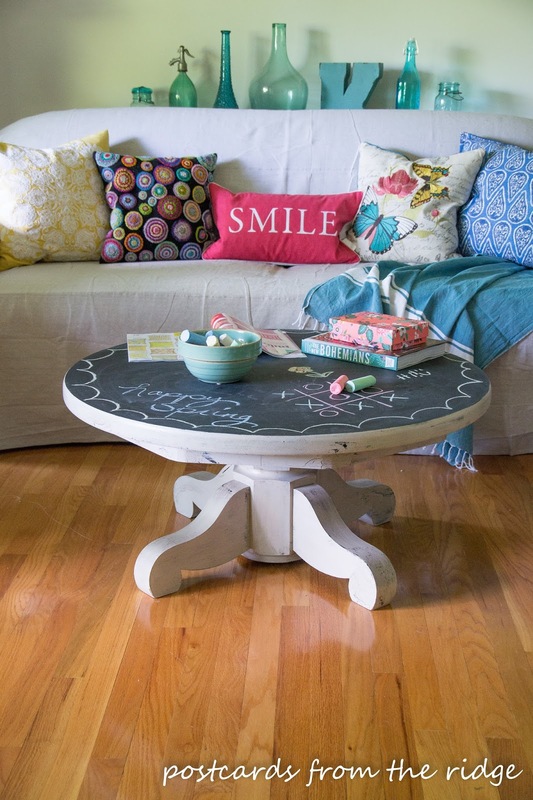 One crackle painted, chalkboard topped table! It's such a fun piece! It adds a fun touch of whimsy to our living room. 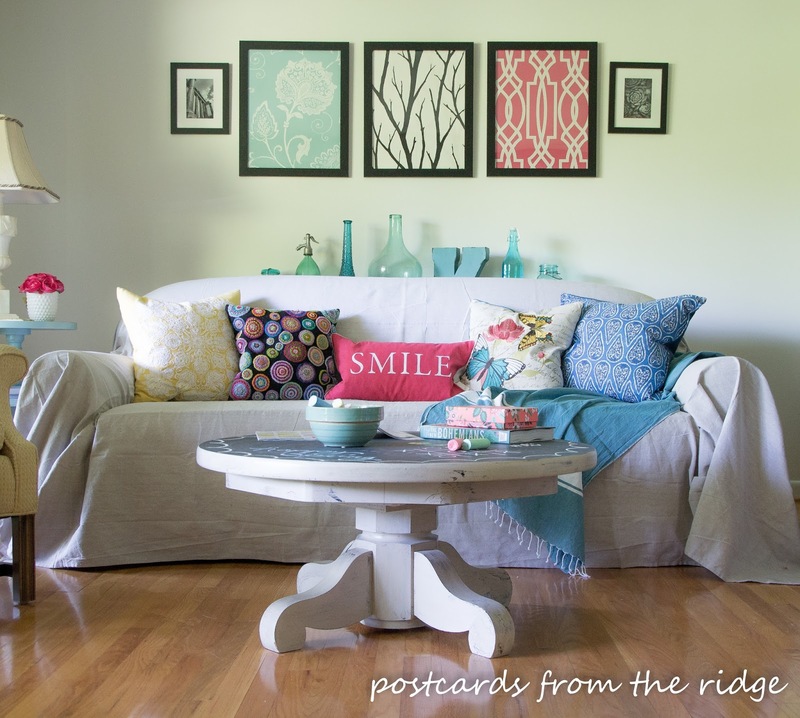 It inspired me to add some spring touches like the bright pillows and the artwork I made from wallpaper samples. To see my easy method of making artwork this way, go here ==> DIY Artwork from wallpaper. 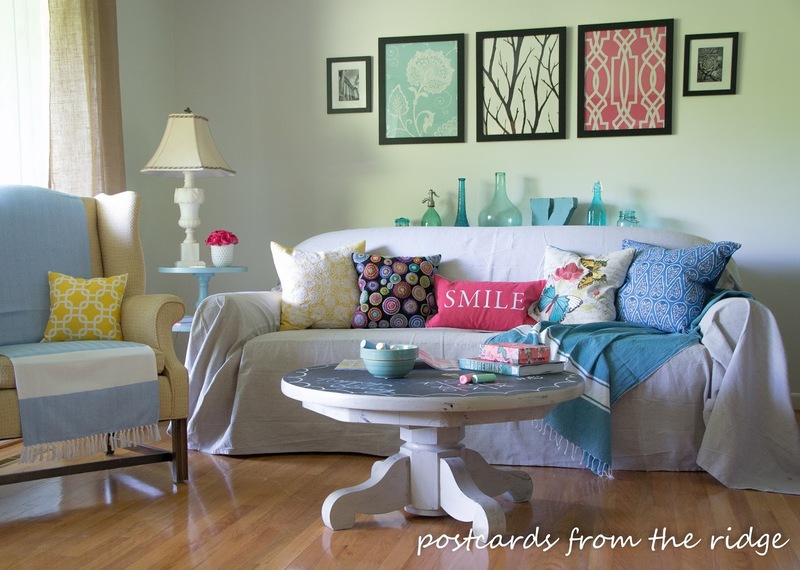 And the colorful pillows inspired me to add more color behind the sofa. Give a mouse a cookie.....or the domino effect. Either way, you know what I'm talking about. One thing always leads to another, am I right? A closeup of the legs shows the character of the crackling process. It's not for everyone, but I don't think a solid white table would have worked in our house. We're not the solid white furniture kind of people; at least not at this point in our lives. The black and white table balances all the color and the black frames and the black pillow in here. And the great thing about this space is that I can easily change out the pillows and wallpaper samples and have a totally different look in here. Easy as pie. I'll probably keep it like this until fall and then oranges and browns and golds will be replace the bright sunny colors. But the table won't have to change at all! Don't forget to drop by and see all of the great makeovers that my friends have done. Just click on the images below and see the story behind each piece. And be sure to leave them a nice comment to let them know how much you like it! 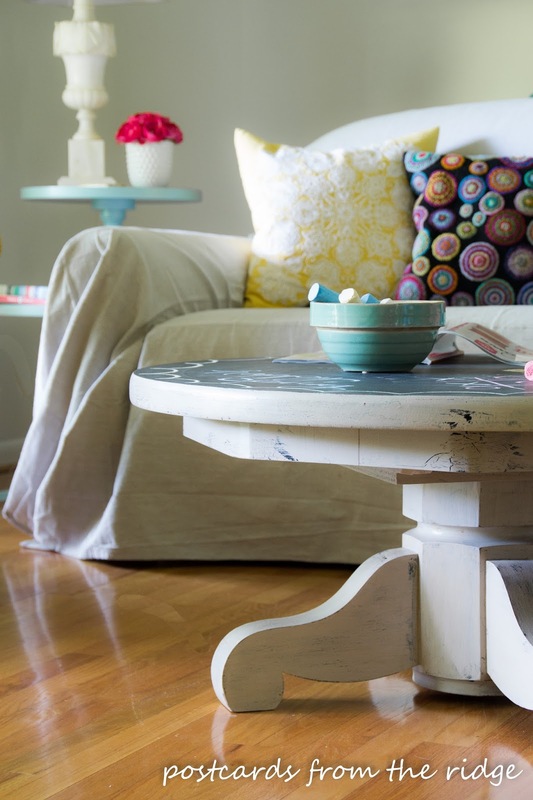 Here are a few previous themed furniture makeovers if you want even more inspiration. Thanks, Larissa! It turned out to be such a fun piece! Thanks, Christy. Yes, the price was right, even with the orange paint. I've passed up some great pieces before as well and wonder what I was thinking! Glad I got this one. 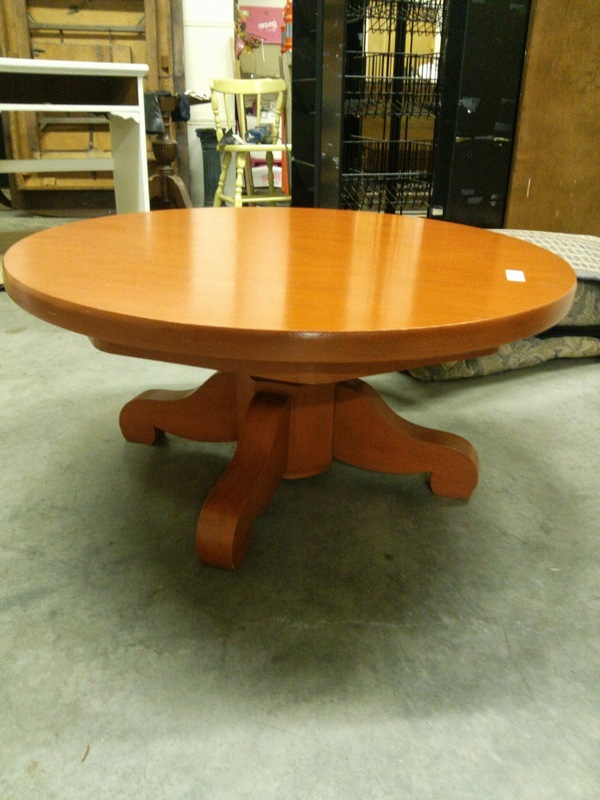 You got a great deal on this table for just $20! 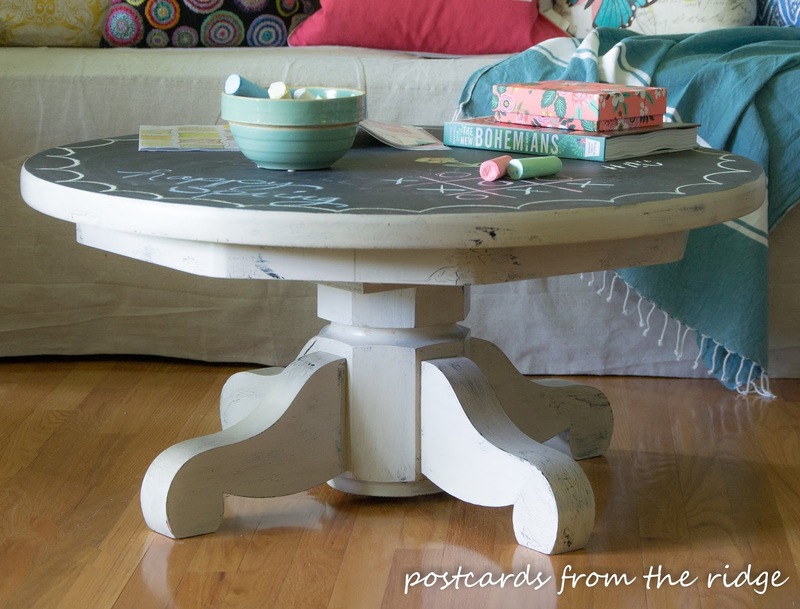 I loved the combination of white crackle with the chalkboard top. 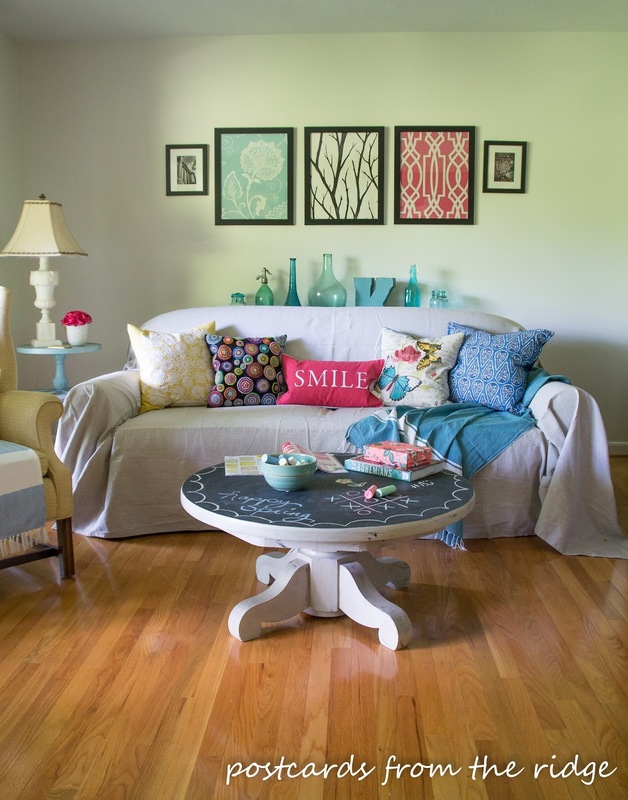 It looks great in your family room. Thanks, Paula. It was a great deal, but needed a little TLC for sure. The challkboard paint has been so much fun. This is so awesome, Angie! I love the crackle effect and the chalkboard on top is such a fun touch! Thanks Breanna! 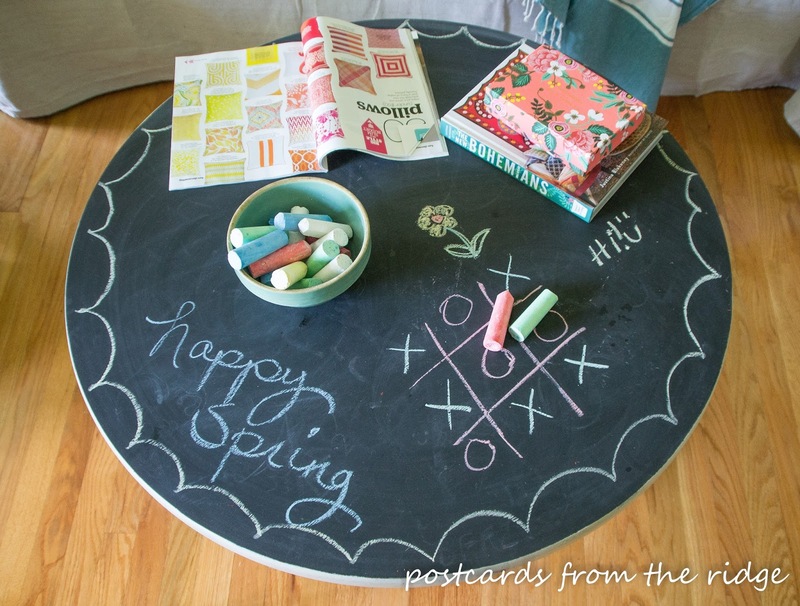 The crackle and chalkboard definitely added a fun element to the table. My girls love it too. That is one cool table! Loving the paint layers and how you used the crackle for character. What a steal for $20 as well! Pinning and sharing my friend! Thanks, Wendi! I had fun with this one and yes it was a bargain even though it needed some TLC. What a fun table! I'd love to have this on my screened porch for summer fun! It would be great on a porch Christy. When I get tired of having it in the living room I might be moving it to our covered deck. Great idea! How fun Angie! That table looks sooo much better now. Have a great weekend! Thanks Kathy! It was a fun project! And it does look much better now, doesn't it? Great job Angie. I love how you updated that $20 table and made it way more modern and functional! Well done!